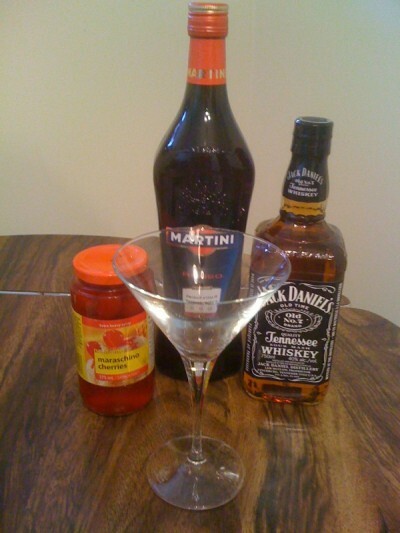 Mmmmm the Manhattan…. or maybe I should call it the Madhattan… is one of my favourite cocktails. Perhaps not as trendy currently as the Martini or the Cosmopolitan it’s still a classic and was a favourite in the 1960s. Depending on where you find your recipe the Manhattan is made with whiskey, rye whiskey, Canadian whiskey, Tennessee whiskey, bourbon or even scotch. Personally, I’ve always favoured the Manhattan as made with Jack Daniels (Tennessee whiskey) and that’s what @RandyMatheson and I are making tonight. The classic Manhattan – whiskey, sweet vermouth and a maraschino cherry to garnish. Yum! In a mixing glass combine whiskey, sweet vermouth and bitters with 2 or 3 ice cubes stirring gently so as not to bruise the spirits and cloud the mixture. Strain into a chilled cocktail (martini) glass and garnish with a Maraschino cherry and a curl of orange peel if desired.